baseball players had been killed in World War II? The answer, as it turned out, was two. in 1939 and died on Iwo Jima in '45. in France, on April 15, 1944. That was his 27th birthday. World War II service in our family tree. So consider Elmer Gedeon a symbol. Monday when his Washington team defeated the Detroit Tigers 4 to 2." playing right field. One at-bat, no hits, one putout, no assists. before the U.S. entered the war, Elmer Gedeon had played his first major-league game. On Sept. 20, Gedeon's position was "m" - or what the boxes then labeled center field. hitless his next three games. He disappeared from the box scores for good. The Cleveland phone directory listed 97 Gedeons. There was one Elmer. A son, perhaps? the one who attended Michigan and played for the Senators. immigrants from Metzenzeifen, in the Sudetenland, were prone to settle in Cleveland. And Gedeon was a common last name in their native land, she said. The 10th Gedeon, Charlotte, said, yes, she was Elmer's third cousin. "He carried my grandmother's casket," she said. "Oh, he was a handsome fellow." "We were only a year apart," Bob said, "so we were very close." on his belly and pulled me out." track and baseball. Football, too? You bet, said Bob, a retired foundry worker. Bob talked about Elmer surviving a 1942 crash during training in North Carolina. navigator on the flight and also suffered three broken ribs. turn out to be true." relative who could be located. 1936-38, playing with renowned backs Tom Harmon and Forest Evashevski. holding American indoor records inthe 70- and 75-yard high hurdles. said on the phone. "He was a very, very humble person for a guy who had all his talent." are about like me.' I joined. But the thing was, there couldn't be too many like him." The Cleveland Plain Dealer sent me some copies of its Gedeon clippings. One 1938 headline jumped out: "He's Too Good For His Own Good." Hours - Saga of Gedeon." another shot with the Senators when he was drafted in March '41. his crewmates from the wreckage. said: "Gedeon Honored With Huge Parade." 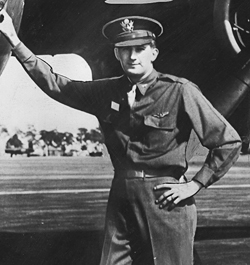 By April 1944, he was based in England and flying the B-26 in missions over France. his wife on April 19, then left on a mission the next day. is that Elmer Gedeon appeared in five big-league games.